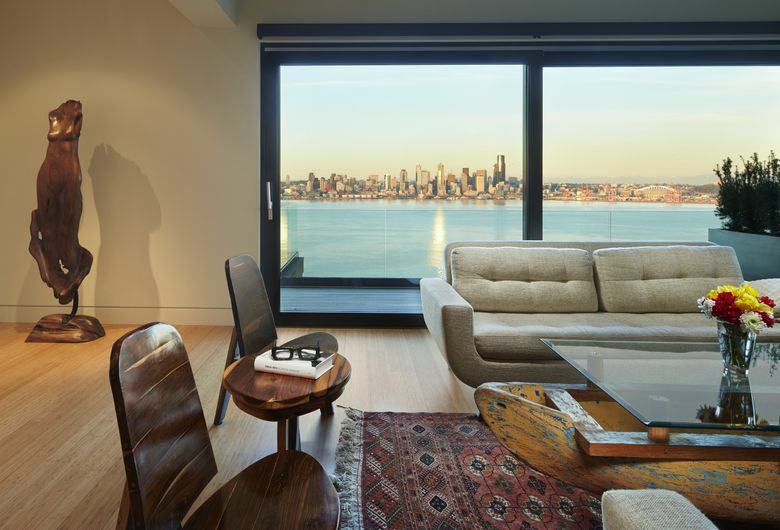 2016 Architecture Issue: In Seattle, people buy homes for the views. But what happens when those views go away? WHAT ARE YOU LOOKING AT? A whole-horizon, Northwest-defining panorama of waves … peaks … pines … skyscrapers? 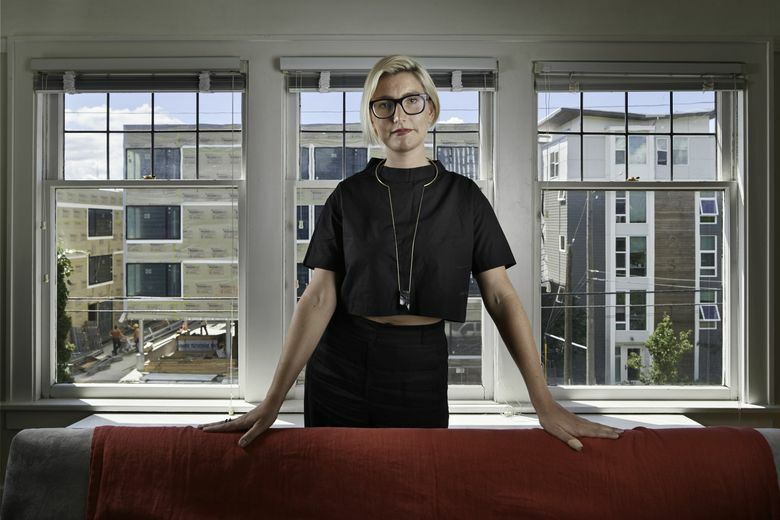 Row after row of glossy windows on the up-and-coming condos next door? Craigslist, just in case today is finally The One Blessed Day a tiny in-city studio costs less than the entire Washington state ferry fleet? Whatever it is, it matters. Views give us a reference point and connect us to where we are, and to nature, and to each other. They inspire us to get up, get out, get involved. They make that tiny in-city studio, or whatever space we’re currently sharing with 10 similarly rent-challenged roommates, feel bigger, lighter, better. And the word “view” in real estate? As golden as all those goose eggs in the listing price. Your view, from your own particular place in the world, holds real value — financially, psychologically, historically, possibly almost universally. • In West Seattle earlier this year, more than 150 trees minding their own leafy business — but perhaps encroaching on the views of their human neighbors — were illegally felled in a public greenbelt that used to be significantly more green. This would not be the first time local trees were sacrificed for a sightline. • In Seattle’s Eastlake neighborhood, renters and homeowners alike have lost prized views — and, they say, much more — to increasingly dense, and increasingly tall and bulky, development. 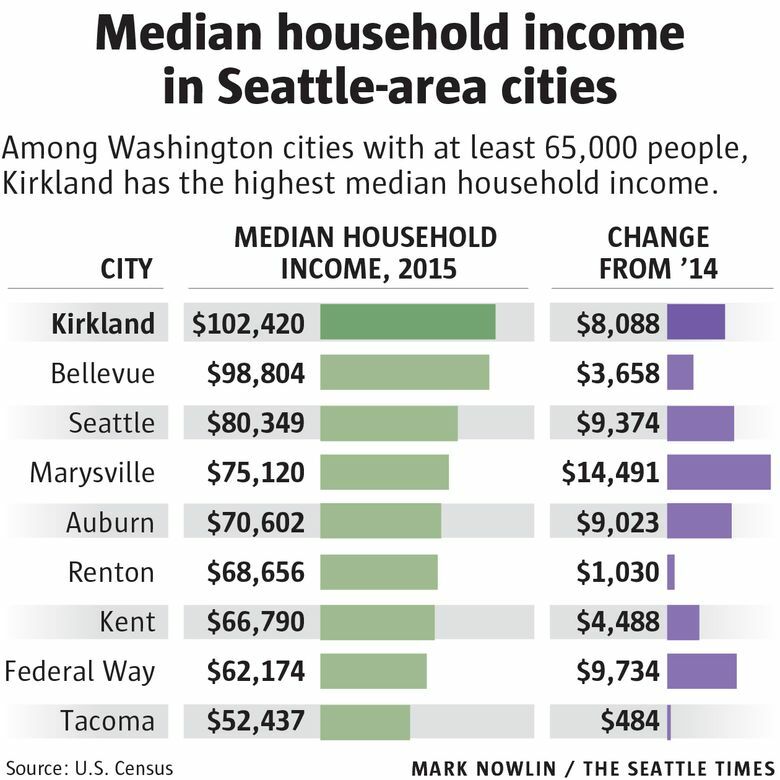 This is not the only place this is happening (is it, South Lake Union?). • Downtown, developers have invested significant sums on air rights to protect their buildings’ jaw-dropping views. • In the view-blessed Innis Arden community, as one example, covenants require homeowners to “erect visual aids” to mark any proposed housing addition or new home that could potentially affect neighbors’ views. Any affected neighbor, and every neighbor within 250 feet, reviews the plans — with the opportunity to approve or disapprove them — before they’re submitted to the community’s board of directors for its final decision. 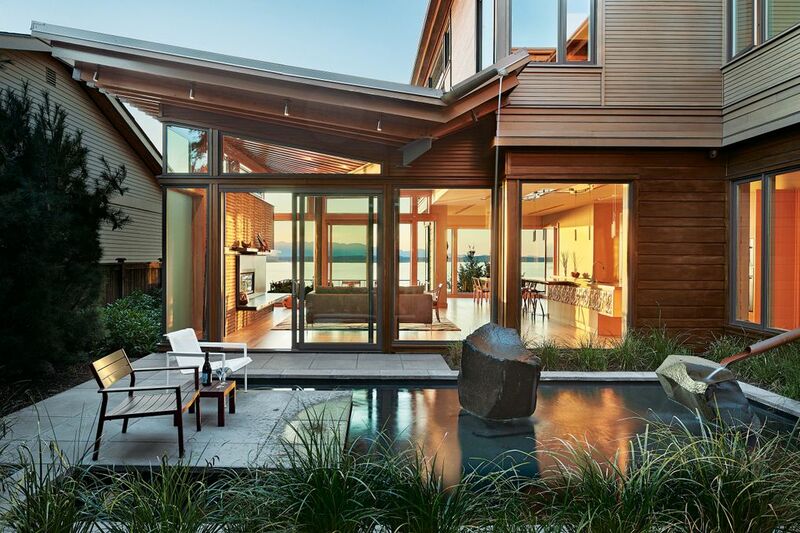 • Everywhere, anywhere, there’s a view, architects design homes around them, residents pay premium prices for them and the rest of us … well, personally, we’re just kinda hoping someone with an excellent one needs a housesitter someday. Views matter, all right — but just how much depends on what you’re looking at. MARY HIEMSTRA IS LOOKING AT units. Units in progress. Units in use. Units on the horizon. Three oodles-of-units developments — two of them microapartment buildings, all of them multistory — now define the entire wide-window vista from her second-floor Eastlake apartment. 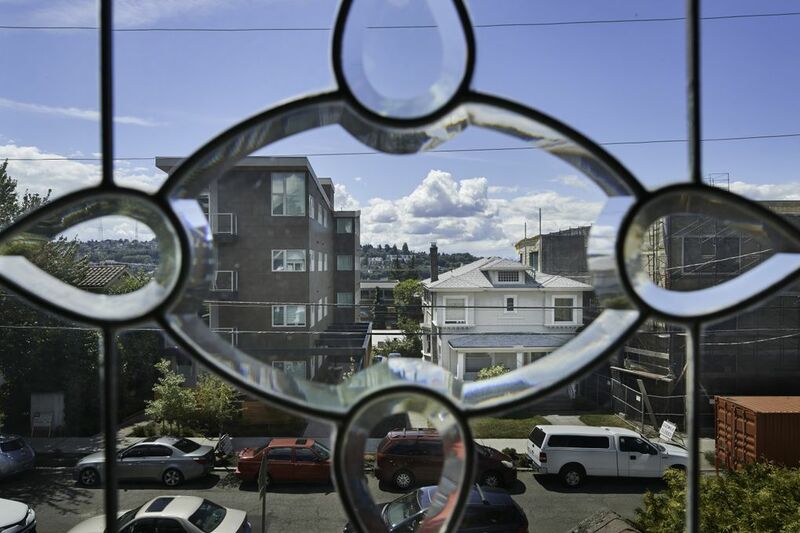 When Hiemstra moved into this beautiful 1925 building, back when it was just 90 years old, her front room faced soothing Lake Union and scenic Queen Anne over a couple (much shorter) Craftsman-style homes. As an architect (specifically, an internal designer for MOD Pizza), Hiemstra is particularly well-versed in, and understanding of, big-picture development issues like urban planning, density, adjacencies and scale. But this. This hurts on a personal level. Financially, Hiemstra says, her rent did not go down when the units went up. “Part of me is a little happy I don’t own this unit. Owning just the condo, it’d be a big monetary hit,” she says — but now, she wouldn’t be surprised if the whole six-unit building were sold … with the next owner just building up higher. Chris Leman, president of the Eastlake Community Council, has lived in the neighborhood since 1987 and has been involved in growth-management issues almost as long. He says that as the city grows (Eastlake has added about 1,000 residents and as many jobs in the past 15 years, he says), there’s a lot of pressure to raise the height of buildings, expand footprints and privatize views. 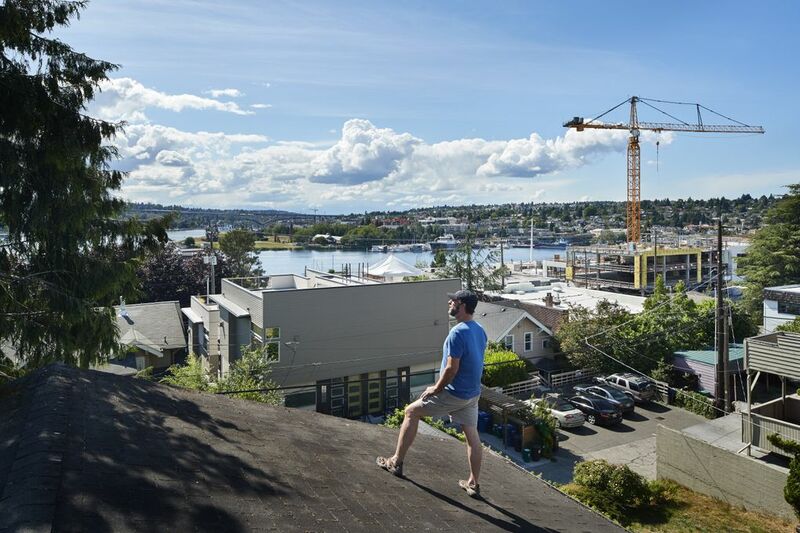 KC McNEIL IS LOOKING AT Lake Union and the Aurora Bridge and the bluest sky you’ve ever seen in Seattle from his only remaining vantage point: the roof. (“OMG — now we have the view,” he announces from on high.) He and his wife, Laurie Stusser-McNeil, have raised their two teenagers (and two Doodle doggies) in this Eastlake home, now with a shiny new sightline interruption. • Worry: What’s coming next, and how much worse could it get? • Encroachment: “They can look right at us,” Laurie says of all those new neighbors. Together, it’s a kind of grief. Keeping-the-blinds-closed grief. 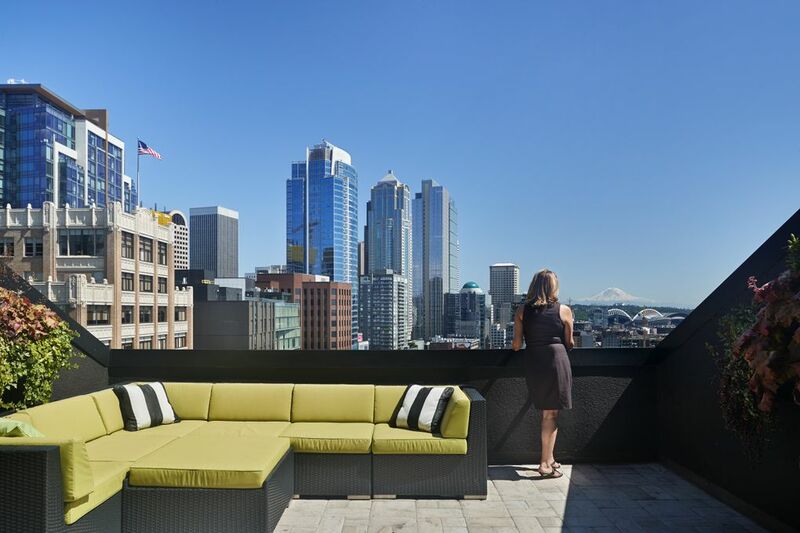 MOIRA E. HOLLEY IS LOOKING AT Seattle — but, really, it’s “Seattle,” as if you were describing the city in one glorious lineup of tourist-luring symbols: the slowly spinning Seattle Great Wheel. The pointy Space Needle. Gliding ferries on Elliott Bay. Bustling Pike Place Market. Giant towering forms: Mount Rainier, the Olympics, a metallic sedge of orange cranes. Holley is 22 floors up, downtown, in a Continental Place condominium with huge angled windows; three terraces; and, if you scurry from the master bedroom to the dining room and lean just right, essentially a wraparound view of everything. Today it is for sale: $2,799,000. And today, and likely tomorrow, and likely the day after, that jillion-dollar view — included with purchase — is not going anywhere. But, “This is one of the most unique vantage points in the city,” Holley says. This one gets it. With a careful caveat. “View protection is largely based on current zoning, public spaces and historic buildings,” Holley says. So, under current zoning regulations, she says, no one may build anything that would stand between Continental Place and its residents’ holy-smokes views. The building developer’s original air-rights agreement, from 1981, caps two small buildings to the south at 65 feet high, Holley says; another neighboring corner houses a historic apartment building. A yet-to-be-built apartment complex eyeing a rare vacancy west of Continental Place is scheduled to reach 85 feet — just up to the sixth floor of the condominium building. Residences start on the seventh. It’s a protection that is recorded on owners’ titles, and reflected in the price they pay for their condos. NILS FINNE IS LOOKING AT the big picture, through an anthropological lens, all the way to early human history. Sometimes you have to step back for the best view. Like any essential element we post-hunter-gatherers need to thrive, “view” stuck by us through our universally evolutionary speed bumps; it resonates in the Japanese concept of “borrowed scenery,” or shakkei, Finne says, and in the towering, power-driven, I’m-up-higher-than-you aesthetic of the English country house. Spiritually, whatever we’re looking at, whatever speaks to us, represents value deeper than the deepest pockets, Finne says: to each of us, and to all of us. 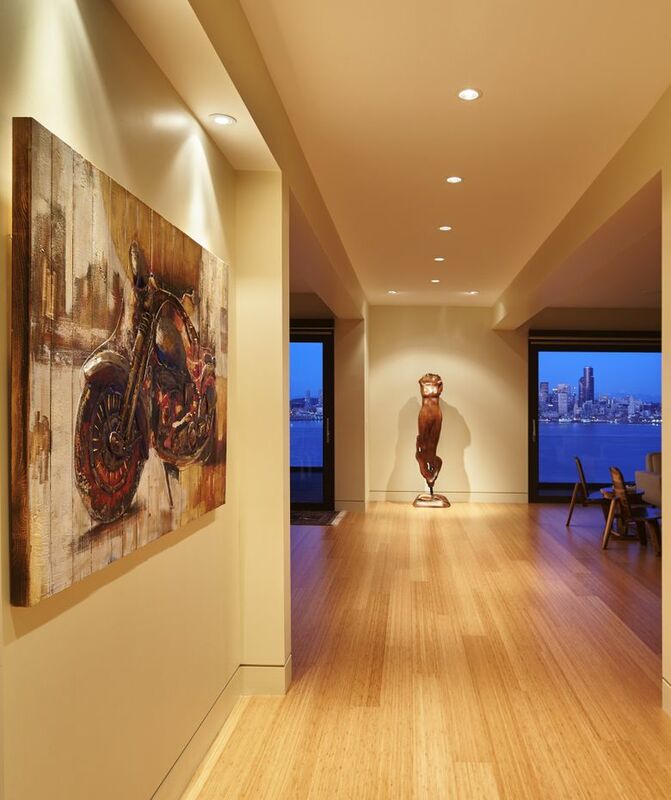 ROGER MARTYNA IS LOOKING AT the expansive view from his own architecturally designed slice of paradise. Today, from his new home in West Seattle, Elliott Bay and the city look more like all the water in the world, every building ever built, an entire endless infinity of sky. “Expansive” is such a sad word sometimes. This is intensely amazing. This house purposefully capitalizes on that view on each of its three levels — and, on one level, in one especially capitalistic way. 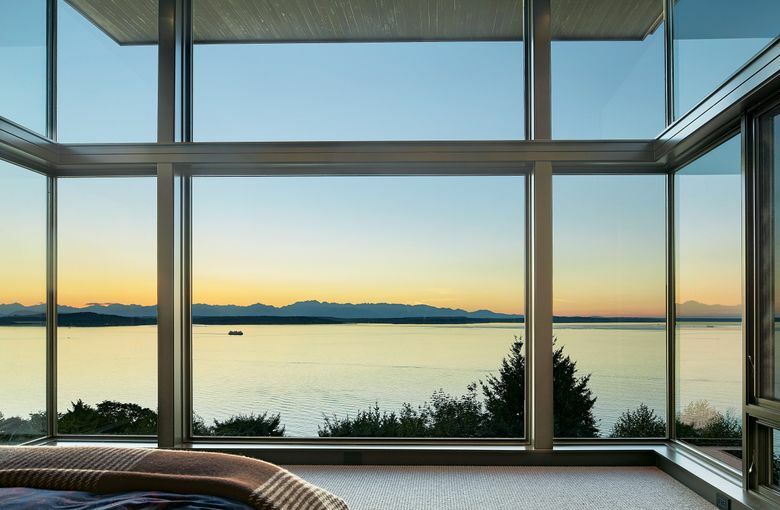 “With a view like it has, it’s fairly easy to lay out the plan,” says the architect, Tom Lambright (Lambright Design Group), who threw in his own wait-for-it moment right off the bat by interrupting one chunk of 8-by-15-foot windows with a solid wall. 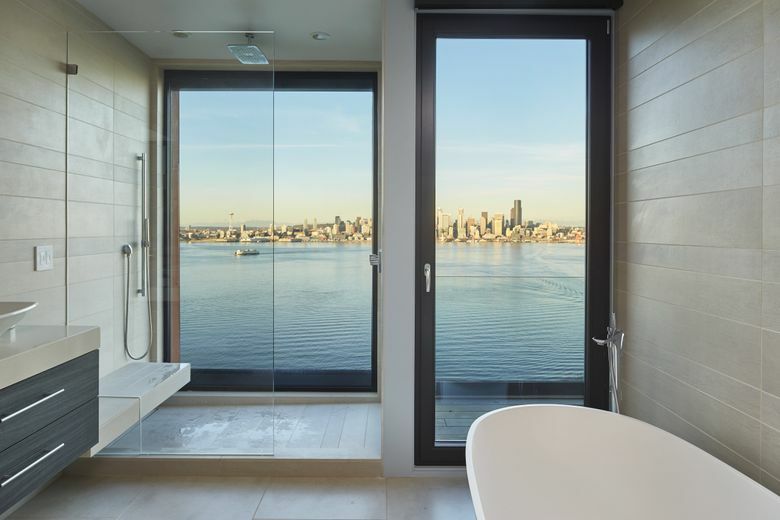 (“I didn’t want to reveal that view from the front door,” Lambright says — “just a tease.”) Upstairs, in the bay-facing master bedroom and bathroom, the reward: view-framing glass, everywhere, even the outside deck railings — and even in the shower. “There was some discussion about the privacy aspect,” Lambright concedes (quickly resolved with, ahem, bottom-up blinds). Downstairs, the view is equally exquisite and equally unobstructed — except, maybe, for occasional strangers milling around on its private terrace: The lower level is designed as a two-bedroom, one-bath, 900-square-foot accessory dwelling unit, which Martyna and Saturay rent out on Airbnb and vrbo.com. 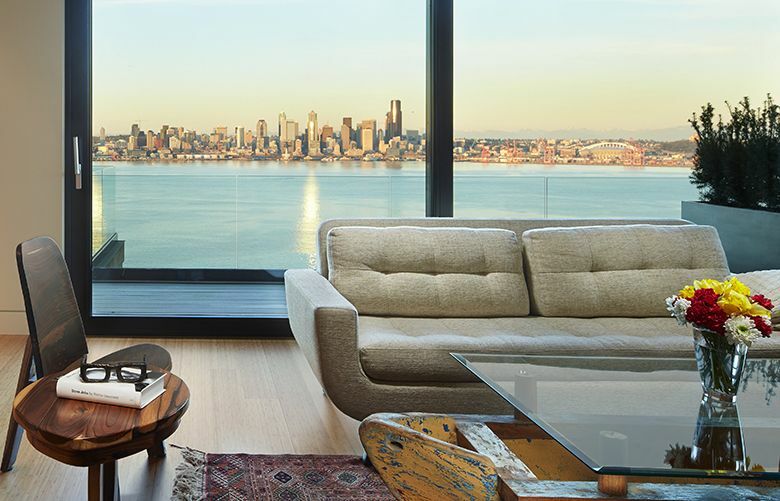 Their Airbnb listing opens with a full-width, full-color, full “OMG” photo that easily justifies the exclamation point at the end of the headline: “New, 180 degree/24 hour bluff view!” With one of the higher nightly rates in a recent search for West Seattle Airbnb rentals, Martyna’s ADU increased from $130 to $150 originally to $225 per night in August. 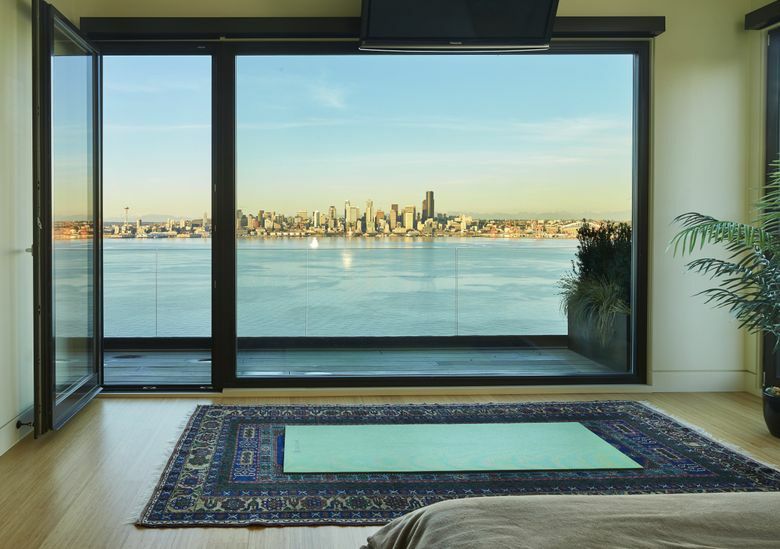 Turns out the view justifies the price, too, especially with local renters. WE ARE LOOKING AT something really special here, architect Finne says — no wonder we so passionately maximize, yearn for, cling to, value our views.